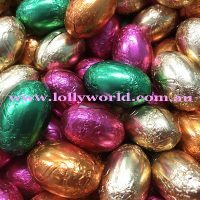 Bulk Mini Eggs Sorini are an Italian milk chocolate that are perfect for the kids that love the Easter Egg Hunt. Use them for your corporate function or promotional giveaway. Add to them to an Easter Egg basket. Each solid milk chocolate, foil wrapped egg, weighs 6g and is roughly 3cm long.